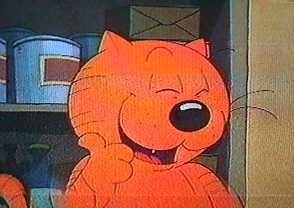 I know a lot of people know who Heathcliff is, but for those of you who don't, Ill explain. Heathcliff is an orange cat who is always getting into trouble in one way or another and got his cartoon start in 1973 on the funny pages, about five years before Garfield, a similar and more well known cat, did. The comic strip was created by now-late George Gatley and is still running to this date. You can check out each daily comic strip in your local paper or, if you dont have Heathcliff, check out creator.coms comic pages. 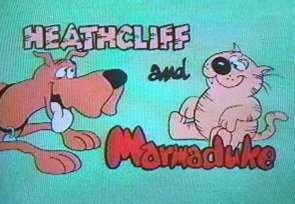 In the second season, comic strip dog, Marmaduke, replaced Dingbat, and the show was renamed Heathcliff and Marmaduke. The changing of dogs was not the problem viewers had with the shows new structure, but the problem was the fact that Heathcliff was given a cuddlier, less rebellious attitude, which made many loyal viewers mad, so they stopped watching. That same season, the alphabet network cancelled the show. 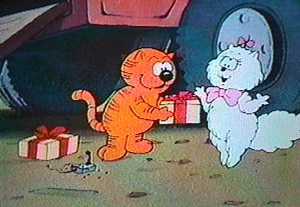 This was not the end of Heathcliff, though. 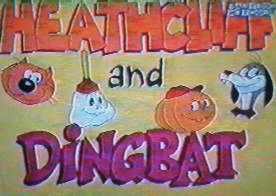 The series obviously was resurrected about two years later in syndication and now animated by DIC (Inspector Gadgets animators) under the title Heathcliff and the Cadillac Cats, with Heathcliffs old attitude restored to its original devil-may-care glory. This new show featured new characters Cats and Co. This pack of alley cats was led by Riff-Raff and featured such characters as beautiful Cleo, smart guy Wordsworth, idiot Mungo and wussy Hector, all up against bad dog Leroy. 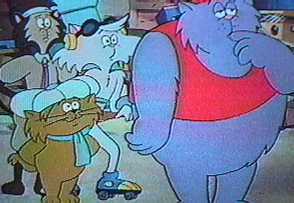 In each episode, this crazy group of cats would try one of Riff Raffs schemes to try to get money or food. The show ran in syndication until about 1989, when it moved to cable for reruns, first on Nickelodeon. My earliest memory of this show watching it the Family channel with my brother and sister, when they also aired Inspector Gadget, and again when it aired on Fox Family Channel. I enjoyed it so much, Im willing to bring it back to the air, and thats why I started this website.